A Market in the Desert n.d.
Born 1865, Melbourne. Died 1915, Melbourne. Emmanuel Phillips Fox studied at the National Gallery School, Melbourne and the Académie Julian in Paris. He painted in plein air artists’ communities in Brittany and Cornwall, also visiting Madrid to study the work of Velasquez. Returning to Melbourne in 1892, he established the Melbourne School of Art with Tudor St George Tucker, teaching European ideas and techniques. Phillips Fox travelled between Europe and Australia many times. He enjoyed considerable success with shows in London and Paris, becoming the first Australian member of the Société Nationale des Beaux-Arts. Returning to Australia in 1913, his exhibition of seventy paintings was received enthusiastically by patrons and the press. A generation of young artists loved the rapid brushwork, colour and dappled light effects in his portraits, landscapes and female figures. He is represented in the National Gallery of Australia, all state and various regional galleries and the Louvre, Paris. 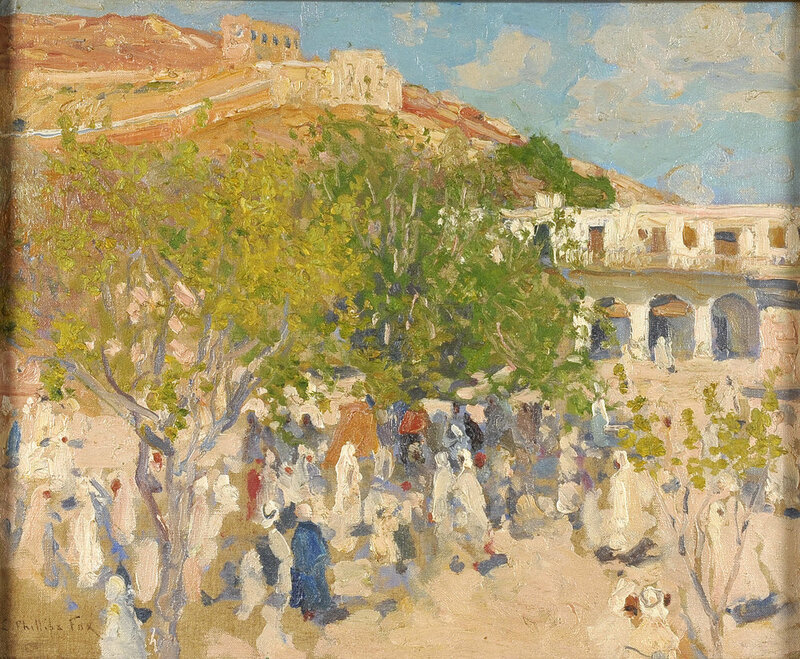 Also known as The Desert Market, this work was exhibited at the November 1913 show held at Anthony Hordern's Galleries in Sydney, being highly praised for its lively, exotic location--a picture that can be read and reread over and over. 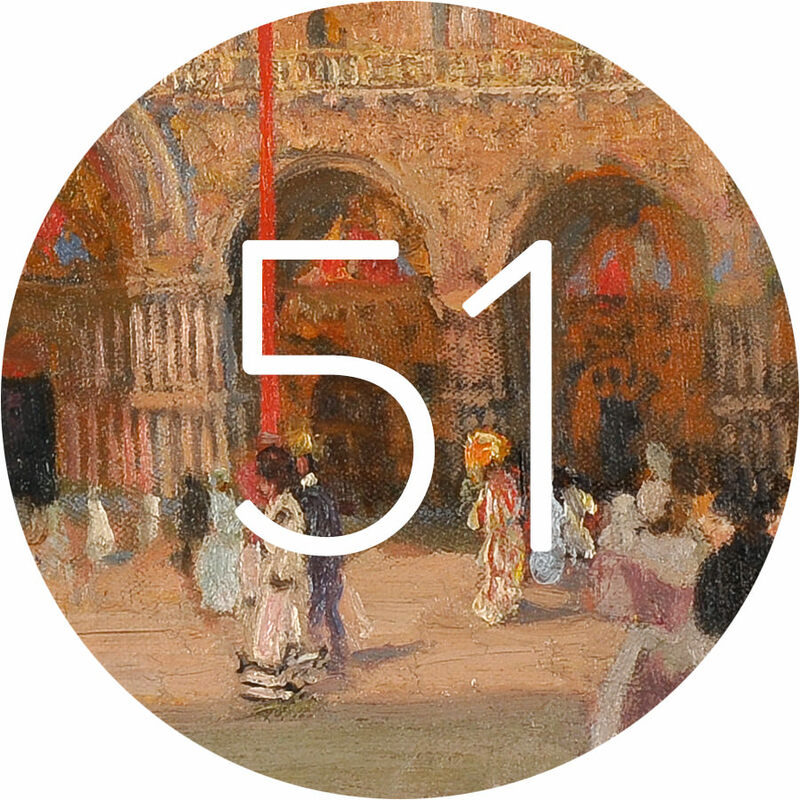 The thick dabs of paint convey the movement of the robed figures in the market ground. We sense the harsh sun in the pinky-cream colours of the hill and the building, and the relief of the shade from a tree in the centre.